It's likely a lost season for the Vikings (though, perhaps, not for their quarterback). Does that mean they can't have fun? No, no it does not. 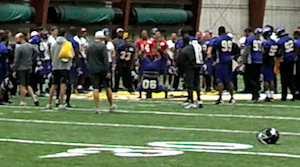 As filmed by VikingUpdate.com, Minnesota broke today's practice with a breakdancing contest. DT Everson Griffen got things started, but it was DE Fred Evans that really brough down the house.